The University of South Florida Diabetes Center, located in Tampa, Fla., has implemented a pioneering communication concept for patients. 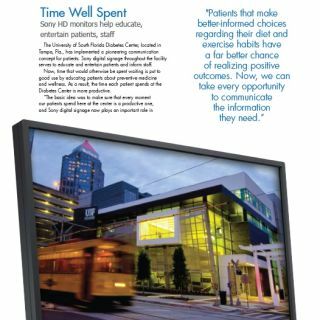 Sony digital signage throughout the facility serves to educate and entertain patients and inform staff. Now, time that would otherwise be spent waiting is put to good use by educating patients about preventive medicine and wellness. As a result, the time each patient spends at the Diabetes Center is more productive. The Sony digital signage solution distributes content through a simple user interface that assigns different server-based programs for specific areas. Patients can review materials privately, or groups can watch presentations together with the use of larger displays or the Sony projector. The decision to implement this concept with Sony professional displays followed a comprehensive review of both professional and consumer HD flat-panel displays. Banea added that what is now in operation at the USF Diabetes Center is also being evaluated at other venues.